The Congregation of Holy Cross was founded in response to the need for education and evangelization in France following the devastation of the French Revolution. Our founder, Blessed Fr. Basil Moreau, C.S.C., brought together a group of brothers, auxiliary priests and for a period of time, sisters, to form a bold vision for a religious community modeled on the Holy Family. Fr. Moreau’s vision carried the men and women of Holy Cross beyond France to the United States in 1841, where the Congregation founded the University of Notre Dame. In the ensuing decades, the Congregation evolved into an international religious community of brothers and priests who minister side by side in more than 15 countries throughout the world today. The brothers and priests of the Congregation of Holy Cross have a long history of collaboration and common charism that educates people in the faith and brings hope to the world. United by our founder, Blessed Fr. 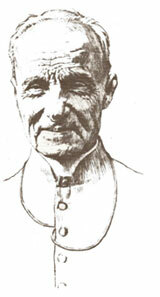 Basil Moreau, C.S.C. in 1837, the brothers and priests of the Congregation of Holy Cross originally ministered to the pastoral and educational needs of the French church. Over the next two decades, brothers and priests responded to the need for evangelization and education beyond France and established ministries in Europe, Algeria, the United States, Canada and even to the difficult mission of Eastern Bengal (Bangladesh). In 1857, the Constitutions of the Congregation were approved by Pope Pius IX, and the two societies formed a closer union with a shared governmental structure and missionary activity that focused on preaching the Word of God and Christian education. Committed to the future, Holy Cross brothers and priests are advancing together as “Educators in the Faith.” The revised Constitutions, published by the General Chapter of 1986, were a conscious attempt to return more closely to the ideal of Blessed Fr. Moreau as a company of men devoted not only to a mission of service, but as a group of clerical and lay religious called to become brothers – to make a common life together and to embark upon ministries in concert with one another. The abbreviation “C.S.C.” represents the Latin title of the Congregation — Congregatio a Sancta Cruce. Alfred Bessette was born in 1845 near Montreal, Canada to a poor, working-class family. He experienced great tragedy in his life—his father died after a lumbering accident when he was only 9-years old, and his mother died from tuberculosis when he was 12. The deaths of his beloved parents, and his own struggles with illness, only made his faith in God and compassion for others that much stronger. After a short stint working in the textile mills of the United States, Alfred returned to his native Canada and pursued his calling as a Brother of Holy Cross. He entered the Congregation of Holy Cross in 1870 and was given the name Bro. André. His first assignment, which was to last him 40 years, was as the doorman of the community’s school in Montreal, Notre Dame College. Bro. André developed a deep devotion to St. Joseph, the foster father of Jesus and the patron saint of the Brothers of Holy Cross. As people came to the school, burdened by their own struggles and suffering, Bro. André directed them to pray to St. Joseph. Through Bro. André’s healing touch, thousands of people were cured and he became known as the “Miracle Man of Montreal.” One of his greatest contributions during his lifetime was building St. Joseph’s Oratory, the largest shrine in the world dedicated to St. Joseph. Bro. André died in 1937 at the age of 91. The last words on his lips were the name of his beloved saint, “Joseph.” Over a million people came to pay him their final respects. Recognizing the saintly life of this humble man, Pope John Paul II beatified him in 1982 and Pope Benedict XVI canonized him on October 17, 2010. To this day, thousands come in pilgrimage to St. Joseph’s Oratory, where his tomb lies, to receive spiritual and physical healing. The memorial of St. André is celebrated on January 6. Fr. Basil Moreau, C.S.C., the founder of the Congregation of Holy Cross, was born in 1799 in a small village near Le Mans, France. He grew up amidst the turmoil of the French Revolution. As a young priest, he felt compelled to revitalize a Church devastated by years of civil war. With nearly two-thirds of France’s clergy and religious exiled or killed, Fr. Moreau helped restore hope by organizing a group of Auxiliary Priests to preach, teach and bring the message of Christ to those in neglected towns and villages. In 1835, at the bishop’s request, Fr. Moreau took direction of the Brothers of Saint Joseph, a group of young men formed into a teaching community in 1820 by Fr. Jacques Dujarié. Following his vision of starting a new religious community modeled on the Holy Family, Fr. 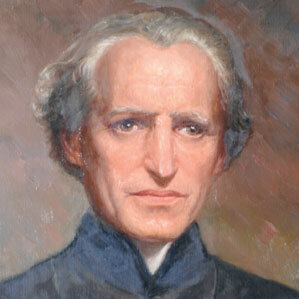 Moreau united his auxiliary priests and the Brothers of St. Joseph in 1837 to form the Congregation of Holy Cross. Four years later, he founded a women’s group, the Marianites of Holy Cross. Together, the Holy Cross religious, united by their founder and their vows, ministered first in France, and later in other parts of Europe, Asia, North and South America, and Africa—always going to places where the needs were the greatest. Fr. Moreau remained Superior General of the Congregation of Holy Cross for many years, enduring trials of every sort. Despite his struggles, he continued to bring hope to others through his preaching and retreats. Pope Benedict XVI beatified him on September 15, 2007, Our Lady of Sorrows, the feast day of the Congregation of Holy Cross. Blessed Fr. Moreau remains an inspiration to men and women who live his vision of “bringing hope to others” in more than 15 countries throughout the world.